I was both very excited and rather apprehensive about this concert, and anyone who has read my previous post on Nigel Kennedy will understand why. I was looking forward to my favourite violinist playing one of the best composers in history, but also steeled for a fair amount of waiting around, whimsical anecdotes, and interminable prog rock noodlings. The 10pm start time came and went, but the 20 min delay was, as Mr K was keen to point out, “not late because of me”, and probably due to a minor security incident or the like, plus it taking a while to ram the auditorium, arena and gallery to a full capacity rarely seen at Late Night proms. And then, with a minimum of fuss, 45-odd minutes of solid, brilliant, wonderful Bach. On the way in I’d overheard the conversation of a couple of what I’m going to (perhaps unfairly) call ClassicFM fans who, while very keen on Nigel, were rather concerned about this JS Bach, and whether the music was going to be “all stuffy” and “difficult”. All credit to them for giving it a go, and I hope the highly-charged, exuberant and joyous Partita No. 3 in E (Prelude), which opened the concert, won them over. The main work, though, was the Partita No. 2 in Dm in its entirety – something of a marathon. *Digression alert* Violinists – were you aware we flutes have been appropriating your music all this time? I have a couple of well-thumbed and scribbled-on volumes of unaccompanied Bach nicked from various partitas, suites, sonatas, etc. for violin, cello and whatever – all transposed to fit the flute range, broken chord appoggiaturas substituting for double-stops. And they work, because the magical thing about Bach is that it sounds good on ANY instrument. Really – any. Even tenor saxophone – I know, I’ve tried. (Didn’t work so well on theremin, but this is almost certainly due to my lack of skill – sure it would sound great if Clara Rockmore was playing it.) Anyway, the 1st movement of the Dm is one particularly frequently hacked through by young flautists, as it was on one of the Grade lists (VII? ), so it was very good to actually hear it on the originally-intended instrument, and more to the point, not hacked through, but played thoughtfully, lovingly, and with each phrase given the depth it deserves. And for the rest of the movements, I’ll go with ‘stunning’, but please help yourselves from the superlative buffet. It’s rare for me to say this, but after the marathon of intensity and virtuosity, I was actually ready for something light – a bit of baroque-jazz crossover, even. Not only does Bach work on any instrument, but it can also take being swung without sounding daft – as has been demonstrated by Swingles et al. Here, Mr K was joined by friends (whose names I didn’t catch) on double bass, guitar and drum (just the one) and used the Air “on the G string” as a launch pad for a riot of quote-heavy semi-improvised jazz shenanigans. Having been described as “all of you cats is like the most knowledgeable in the world”, no less, the audience had not emitted a single clap between movements of the Partita (saving them all up for thunderous applause at the end), but were also aware that in the jazz tradition it is correct etiquette to applaud as each member of the band finishes their solo. The obvious tension between knowing one is supposed to show appreciation at a certain point, and the orchestral fan’s ‘but- but- there’s music playing and we don’t want to make a noise and so miss a single note of it!’ was quite amusing. Encores were all Fats Waller tunes, and they were charming. At around 11.40pm, the audience reluctantly let the man go, hopefully to enjoy a few well-deserved beers and bask in the afterglow of an awesome gig. 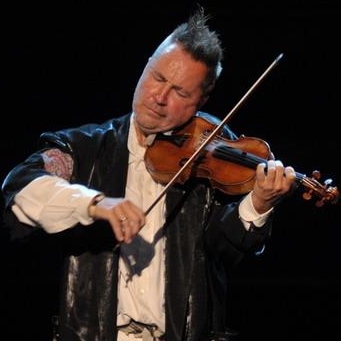 ‘I thought, “why don’t I just start my own orchestra?”, then I’m not going to have these hypothetical discussions about what is possible and what isn’t – just do it!’, wrote Nigel Kennedy in the programme notes for this, the largest-scaled concert of the Southbank Centre’s Polish Weekend. Juxtaposing compositions by J. S. Bach (1685-1750) and Duke Ellington (1899-1974) two masters of harmony, melody, and – importantly – improvisation, and performing them with a group of performers from classical, jazz, and other musical backgrounds, it certainly promised to be an interesting evening. And yet… I can’t help feeling there’s a back story to the subject, that doesn’t sit comfortably in a formal review context, and is better suited to a blog post. So, a companion piece, of sorts. My next Kennedy purchase was the Bruch/Mendelssohn CD, which is particularly associated for me with age 16-18. Although my teens were by no means unremittingly miserable, I had some periods of great stress, adding to and drawing from severe insomnia. During stressful periods (A-level exams, university auditions, romantic disasters, etc.) I got into the habit of listening to the Bruch on headphones in bed every night before trying to get some sleep. For some reason, it had an unusual power to calm me and temporarily make all seem well with the world. At university I used the (1991) Brahms concerto in the same way. It seems obvious in retrospect that orchestral music (both performing or listening) should be such an important part of my life, be able to give me intense enjoyment when happy, and keep me sane in times of stress/illness/heartbreak/etc. – I can’t imagine it any other way. Of course, I could make a long list of favourite recordings by Nigel and other favourite artists – but there is no doubt in my mind that these three are not only tied to particular points in my life, but played a special role in my developing relationship with music. At university, for a while I had a poster of Nigel on my wall, to the general derision of non-musical friends (for the bad clothes) and fellow music students (for being populist), but remained unapologetic. Given that I was at that point mostly immersed in the 2nd Viennese School and the development of total serialism, the idea of me liking something because it was popular was somewhat unconvincing; besides, now and then things become Very Popular because they are Very Good. And someone wearing a tie-dyed shirt topped with a waistcoat (yes, this was the early 90s) has no business commenting on anyone else’s sartorial choices. For the record, I might mention that the walls of my student residences also featured Simon Rattle, Philip Glass, Arthur Brown and Jim Bob (although I drew the line at Ian Anderson). Visual appearance is irrelevant in my musical allegiances (although looking nice never did anyone’s popularity any harm, and yes, I mean you, Emmanuel Pahud), as, frankly, is anything they have to say for themselves. This is not to say that it’s not absolutely fascinating to hear some musicians talk (including some of the above) – just that it’s a bonus, not a requirement. (a) I really don’t like hearing little snippets of larger work – something some of my operatic friends describe delightfully as ‘bleeding chunks’ recitals (albums, etc.). A concerto (symphony, opera, etc.) is a single entity, and to play a single movement is like opening a lovely bar of chocolate, snapping it along the helpful moulded divisions – and then chucking half in the bin. In fact, it’s worse than that, because each chunk is part of a more complex structure, and becomes less enjoyable when taken out of context – like (desperately trying to keep the chocolate analogy going) eating just the icing but not the cake underneath – a quick rush, perhaps, but ultimately unsatisfying. Additionally, irrespective of cropping, it’s much harder to maintain one’s concentration in a concert made up of a lot of little pieces than a couple of long ones, which goes against the received wisdom that the ‘MTV generation’ need everything in 3-minute bites. Good music transports the listener and changes one’s experience of the passage of time; it does so less effectively if every time you start flying away, you’re swiftly brought back down to earth with a thump and the spell broken. (b) I don’t like too much (ok, any) talking about the music or the musicians during concerts. I work with some conductors who like to talk a bit, and, to be fair, know some audience members who like to hear it, but as far as I’m concerned, that’s what programme notes are for. I’ll (generously!) make an exception for new or rare works, concerts where the composer is present to conduct or perform their own work, and a Phil Brit concert I did a while back where they got an actor to read some interesting selections from Mozart’s letters interspersed with the pieces composed at that point in his life. (c) Crossover. Fusion. Terms which are rarely used in a complimentary manner, but this is mostly because a great deal of genre-blending music is vile – not at all the same thing as disapproving of it on principle. The most heinous kind is when ‘classical’ music is fused with pop, in a deliberately dumbed-down Easy Listening nightmare of cheese; however, apart from that particular kind, I’m all for cross-genre experimentation. I wouldn’t go quite as far as Duke Ellington, who resisted any classification of music other than ‘good’ and ‘bad’, but musical categories are certainly not clearly-defined, and there’s considerable blurring and disagreement around the boundaries (although, for that matter, no two people could agree completely over what would fall into Ellington’s two categories). It’s all a question of how well it’s done – and that, again, is very much down to personal taste. I think that’s quite enough self-indulgent rambling from me. I don’t blog very often – does it show? Still, you didn’t pay any money for it and could have left any time you liked without anyone knowing. Congratulations to anyone who got this far! Please consider leaving a comment below and telling me where I’ve got it all wrong. * Edit (2013): Doing a bit of research for an article, it seems my dates above don’t add up, and this blogpost may contain historical inaccuracies. Whatevs. That’s how I remember it.